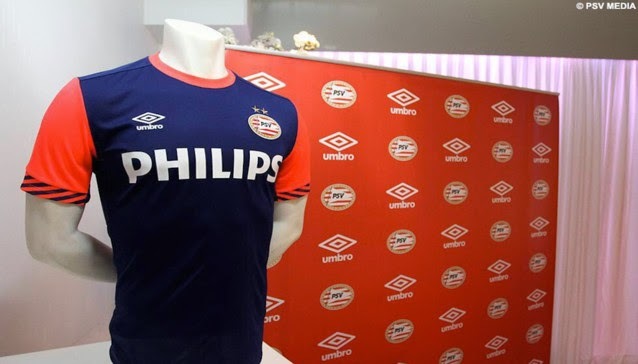 Dutch club PSV Eindhoven will be ending their 20 year partnership and kit suppliers contract with American giants NIKE as today the club has revealed their new 5 year deal with “Umbro” starting from 2015-16 season to 2019-20 season. The current PSV kits were made by Nike and it will be the last season when PSV use Nike kits, Umbro on the other hand has already released the training kits for 2015-16 season. This will be the second most expensive kit contract in history of dutch football, Ajax Amsterdam has a longterm kit contract with Adidas where a extension was signed for another 10 years back in 2009 with substantial upgrades in contract, racking in around $100 million over the next 10 years. So this PSV contract with Umbro is second highest in Dutch league comes at a very good stage, Nike were in the running to extended their 20 year partnership with PSV but they backed off as they were not willing to improve the financial terms and thats where Umrbo jumps. PSV is one of several high profile clubs around europe which has signed a kit deal with Umbro after they broke back into the market since leaving NIKE. Following image is the official training kit released by Umbro for PSV to be used in 2015-16 season and the match kits will be released in the pre-season this year.